We are proud to welcome you to the Third Edition of “Armenia” International Music Festival 2019, which we are organizing from Sept 17-24 in Yerevan city, the capital of the Armenia, one of the well-known musical centers of the world and famous for its musicians, artists, and composers. 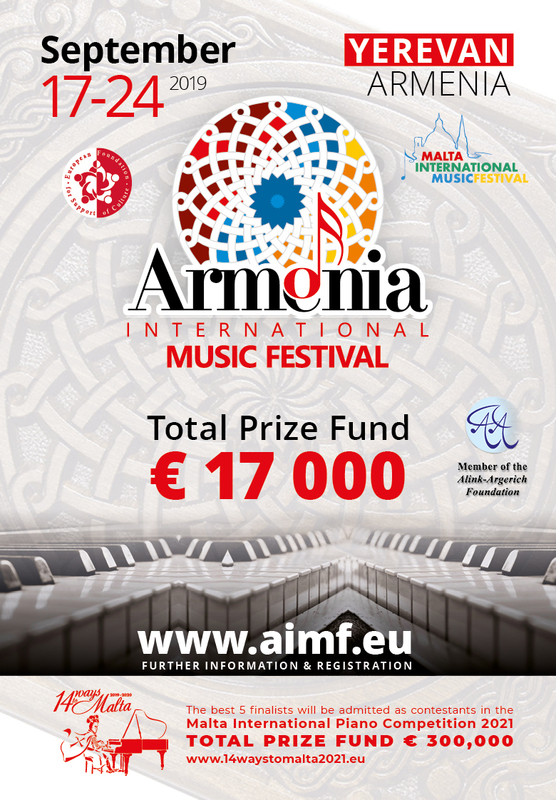 The “Armenia” International Music 2019 makes part of the big series of 14 international piano competitions where 5 best participants of each competition will be invited to participate at the Malta International Piano Competition 2021 within the framework of the “Malta International Music Festival”. The significant mission of the European Foundation for Support of Culture through the presentation of “Armenia” International Music Festival is to discover, promote, support and document the great masters emerging in this generation; to rediscover unusual repertoire while providing the audience with a unique musical experience; to build the audiences of the future to help ensure the very existence of classical music.